John Arthur Lomax - When I was a boy - Online gallery supplying original fine art. Trending Modern British and Contemporary Welsh. Available for sale from Big Sky Fine Art; this original oil painting by John Lomax, dating from around the turn of the century.<br> The painting is presented and supplied in its’ original ornate and elaborate frame.<br> The painting is signed lower right.<br> Previously with W. Barker & Co. Alexandra Gallery, Royal Parade, Harrogate.<br> <br> The highly acclaimed artist John Arthur Lomax was born in Manchester in 1857. He studied art in Stuttgart and at the Munich Academy before returning to Manchester. He later relocated to London where he lived and worked for the rest of his life.<br> <br> He worked in oils, mostly on figures from the 17th and 18th centuries, especially scenes from the Civil War and jovial gatherings. This picture of a gentleman retelling stories from his youth is not untypical, with its sentimental theme and warm, jovial atmosphere. He specialised in capturing the dynamics of human conversation and interaction. <br> <br> Lomax exhibited 33 paintings at the Royal Society of British Artists and other major galleries, including the Walker Art Gallery, Liverpool, the Manchester City Art Gallery, the Royal Academy and the Royal Institute of Oil Painters. 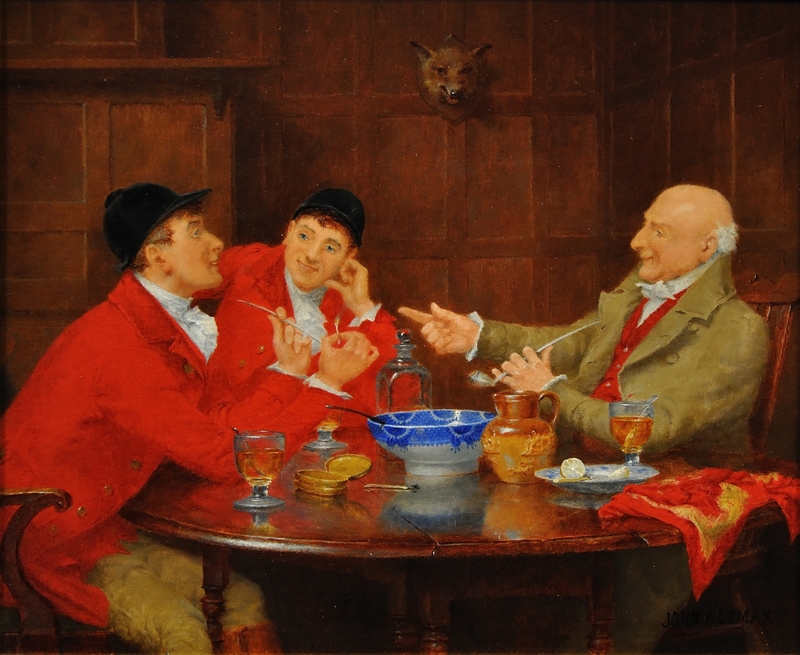 <br> <br> Today his works can be seen in the National Collection public catalogue foundation, the Royal Academy, the Liang Art Gallery, Newcastle upon Tyne, the Sheffield City Art Galleries and the Walker Art Gallery, Liverpool.<br> <br> This cheery scene, painted in oil on panel, is typical of Lomax at his best. It depicts an elderly gentleman seated at a polished round wooden table. 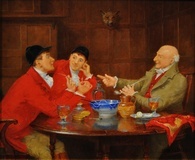 He is wearing an open mustard coloured jacket and red waistcoat and is animated as he regales his two drinking companions with tales of his youth. The companions are younger men, dressed in red riding jackets, black riding hats and jodhpurs. They all wear formal white shirts with neckties suggesting a common status. The scene is likely a public house or gentleman’s club. On the table, there are goblets, a punch bowl with blue decoration, a glass decanter and a plate with half a lemon, and a red cloth. In the background the walls are panelled in a dark wood, possibly mahogany, and there is the mounted head of a stuffed fox, no doubt a prize of former conquests. The mood is warm, relaxed and convivial and from the Victorian period. Available for sale from Big Sky Fine Art; this original oil painting by John Lomax, dating from around the turn of the century. The painting is presented and supplied in its’ original ornate and elaborate frame. Previously with W. Barker & Co. Alexandra Gallery, Royal Parade, Harrogate. The highly acclaimed artist John Arthur Lomax was born in Manchester in 1857. He studied art in Stuttgart and at the Munich Academy before returning to Manchester. He later relocated to London where he lived and worked for the rest of his life. He worked in oils, mostly on figures from the 17th and 18th centuries, especially scenes from the Civil War and jovial gatherings. This picture of a gentleman retelling stories from his youth is not untypical, with its sentimental theme and warm, jovial atmosphere. He specialised in capturing the dynamics of human conversation and interaction. Lomax exhibited 33 paintings at the Royal Society of British Artists and other major galleries, including the Walker Art Gallery, Liverpool, the Manchester City Art Gallery, the Royal Academy and the Royal Institute of Oil Painters. Today his works can be seen in the National Collection public catalogue foundation, the Royal Academy, the Liang Art Gallery, Newcastle upon Tyne, the Sheffield City Art Galleries and the Walker Art Gallery, Liverpool. This cheery scene, painted in oil on panel, is typical of Lomax at his best. It depicts an elderly gentleman seated at a polished round wooden table. He is wearing an open mustard coloured jacket and red waistcoat and is animated as he regales his two drinking companions with tales of his youth. The companions are younger men, dressed in red riding jackets, black riding hats and jodhpurs. They all wear formal white shirts with neckties suggesting a common status. The scene is likely a public house or gentleman’s club. On the table, there are goblets, a punch bowl with blue decoration, a glass decanter and a plate with half a lemon, and a red cloth. In the background the walls are panelled in a dark wood, possibly mahogany, and there is the mounted head of a stuffed fox, no doubt a prize of former conquests. The mood is warm, relaxed and convivial and from the Victorian period.